Repetitive impact activities, such as running and jumping, can cause small cracks in the bone called stress fractures. These most often occur in the weight bearing bone, the tibia, of the lower leg. Athletes with lower bone density, due to dietary issues or genetic predisposition, are more susceptible, as are athletes who train on hard surfaces at increased distance and duration. Women are more susceptible to this injury than men due to bone density deficiency conditions such as irregular or absent menstrual cycles, eating disorders or osteoporosis. The tibia (shin bone) is the larger and more medial of the bones in the lower leg. At the proximal end, the medial and lateral condyles articulate with the distal end of the femur to form the knee joint. The tibia tuberosity is a roughened area on the anterior surface of the tibia. The tibia is the weight bearing bone of the lower leg and therefore takes a large amount of the force of impact during running and jumping activities. This force is transferred up the length of the bone. Bones are constantly repairing and rebuilding, leading to the robbing of calcium from one area of the bone to build another, causing a weak area. When the impact is transferred up the shaft and encounters a weak area, due to either calcium deficiency or a prior stress fracture, the bone will crack slightly. Overtime, this leads to a more serious crack or fracture. Fatigued muscles also contribute to the possibility of stress fractures. The muscles are meant to take some of the shock away from the bones but a fatigued muscle is a poor shock absorber. Repetitive stress on the bone through impact activities such as running or jumping. Low bone density. Muscle fatigue leading to lower shock absorption by the muscles. Pain with weight bearing, worsens with activity and diminishes with rest. Pain is most severe at the early stage of activity, subsiding in the middle and returning at the end. Point tenderness and some swelling possible. If left stress fracture unattended, a stress fracture can become a complete fracture and lead to complications such as bleeding and nerve compromise. The pain from an untreated stress fracture may lead to a complete cessation of activity and further injury to surrounding tissues. Seek medical help if any instability is noted in the lower leg, or inability to bear weight. During the recovery phase, it is important to maintain fitness levels by using low or non-impact activities such as swimming or biking. Strengthening the muscles of the lower leg will help add extra shock absorption. Warming-up properly and using cross training techniques to limit the impact of the bone will help prevent stress fractures. Stress fractures generally heal completely with rest. Returning to activity too soon may cause a recurrence. Very rarely surgical intervention may be needed to strengthen the bone at the fracture site. 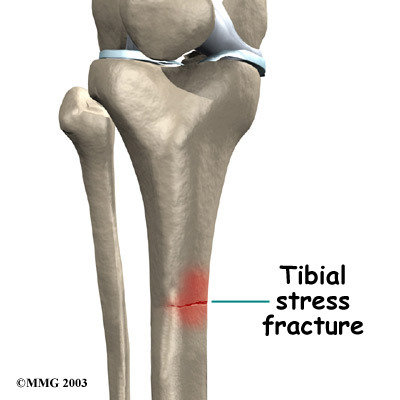 Call (+65) 6471 2674 (24 Hour) to fix an appointment to see our doctor to treat Tibia Stress Fracture today.